Moderate amounts of caffeine are considered safe for you to consume, but large amounts of drinks and foods that contain caffeine can cause damage to your teeth. 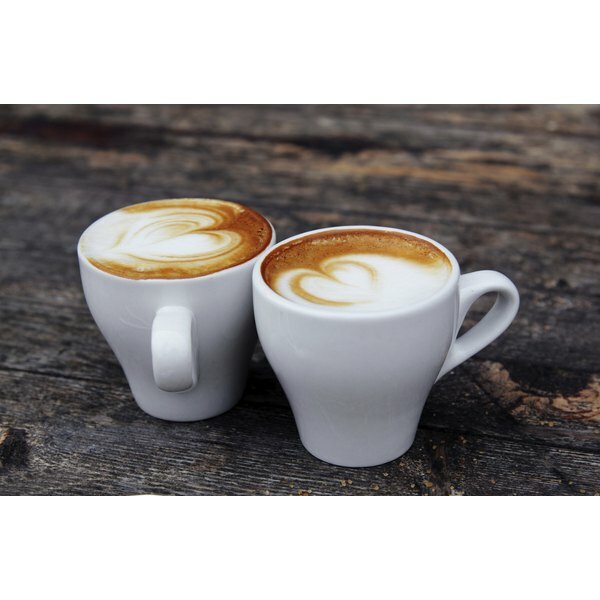 The Food Research Institute, creator of "Food Safety 1995," reports that the amount of caffeine you consume can affect the health and appearance of your teeth. Knowing these effects can help you restrict how much caffeine you consume each day. Drinks that contain caffeine can leave stains behind on your teeth, report Donna J. Phinney and Judy H. Halstead, authors of "Delmar's Dental Assisting: A Comprehensive Approach." Consuming coffee, tea and soda in large quantities can cause your teeth to yellow or cause unsightly brown stains to occur between teeth as well as on the surface. Cutting down on the amount of caffeine you consume can help prevent further staining and damage to your teeth. It is also recommended that you drink coffee, tea and soda out of a straw to minimize how much of the drinks come into contact with your teeth. See your dentist regularly to help reduce the amount of staining that appears on your teeth. The enamel on your teeth is what helps keep your teeth strong and healthy. As enamel wears off, your teeth are vulnerable to damage and disease, notes the Food Research Institute. Large consumption of caffeine is related to the degradation of the enamel on your teeth. Reducing how much caffeine you drink each day can help protect the enamel that remains on the surface of your teeth so you can help avoid cavities and dental disease. Drinking through a straw can also reduce how much of the caffeinated beverage comes into contact with the surface of your teeth. See your dentist regularly as well because he will have tips and advice about how to protect enamel. Large intakes of caffeine are associated with stress and an inability to sleep well, reports Stephen Cherniske, author of "Caffeine Blues: Wake Up to the Hidden Dangers of America's #1 Drug." Consuming caffeine in the hours before bedtime can cause you to clench your teeth while you sleep. Teeth clenching can lead to jaw pain as well as pain in your teeth. Avoiding caffeine in the four hours before bed as well as limiting your consumption throughout the day can help reduce your stress level and alleviate teeth clenching during the night. Your dentist can also recommend devices that can keep you from clenching your teeth while you sleep.